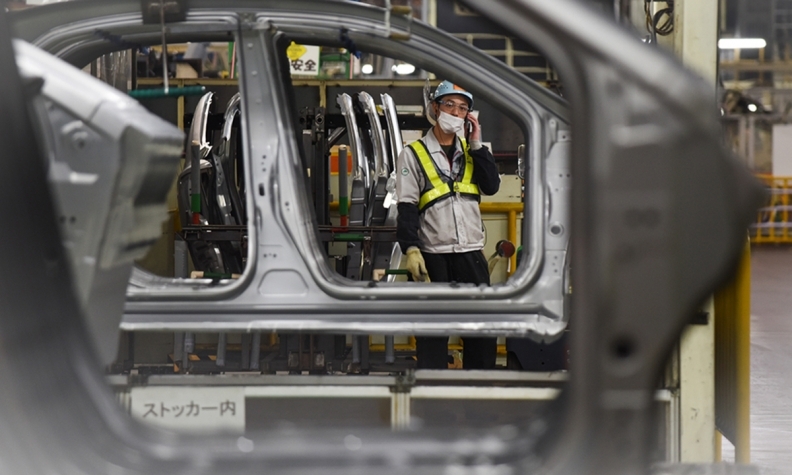 An employee stands by Prius body frames inside the Toyota Tsutsumi Plant in Japan. Over decades, Toyota Motor Corp. built a corporate culture that was the envy of the manufacturing world. Now, the auto industry's most-emulated company is overhauling the way it brings its vaunted production system to every corner of the business. The automaker last month created a single group, staffed with 200 employees, to manage the Toyota Production System, centralizing a function that was spread out through the organization. Their task is to evaluate how core concepts such as kaizen, or continuous improvement, can be applied to new businesses that include car-sharing and consumer robots. The person in charge is 59-year-old Shigeki Tomoyama, a career Toyota executive who wields a tablet during events, making him look more like a Silicon Valley software engineer than a car guy. "We want to systematically go over every step in our processes -- from r&d to manufacturing, sales and servicing -- in order to raise the combat effectiveness of our business as a whole," Tomoyama said in an interview last month. "The backdrop to all this is President Toyoda's extremely strong sense of crisis." While analysts expect Toyota on Tuesday will report that net income dropped for the first time in three quarters, it's probably still on track to post annual profit growth for the first time in two years. Still, President Akio Toyoda says the automaker his grandfather founded eight decades ago needs to move faster to keep up with the likes of Google and Uber Technologies Inc. in the race to make cars connected, autonomous and electric. "Toyota is developing electric vehicles and other new technologies, but at the same time, they're going back to basics," said Seiji Sugiura, an analyst at Tokai Tokyo Research Center in Tokyo. "Their strength doesn't just lie in hardware, but also in soft power. So reinforcing that by creating the TPS group to implement it across manufacturing and sales is a positive thing." In the last two years, Toyota has opened a Silicon Valley research centre, set up a US$100 million venture capital fund and started software companies in Japan and the U.S., with plans to add a European branch this year. The automaker says it will spend a record US$9.7 billion on r&d in the 12 months through March. In December, Toyota announced plans to have at least 10 battery-electric vehicles in its lineup by the early 2020s, from zero now. Last month, Tomoyama was promoted to become one of just six executive vice presidents at Toyota. In addition to heading the Toyota Production System group, he has a sweeping portfolio that includes being chief of information security, leading the automaker's big-data drive, and helming the motorsports division. Tomoyama earned his kaizen credentials in the early 1990s, when he worked in the Production Research Division, known within the company as the "temple" of the Toyota Way, where engineers scrutinized every inch of the manufacturing process. In 1997, he was appointed by Toyoda, then a midlevel manager, to lead a task force working on a knotty problem: Despite the company's success at shaving seconds off production times, cars tended to languish on lots before being shipped to dealers. Tomoyama's diligence earned him the nickname "kaizen man" from Toyoda. "If we want to make the most of Toyota's strength in creating new business models, it's going to require applying TPS," Tomoyama said. "We want to show people inside and outside the company that TPS is still central to Toyota."